he Casino was designed and built by Giovanni Vasanzio at the beginning of the 17th century, by order of cardinal Scipione Borghese, nephew of Papa Paolo V, as a summer residence close to the Papal Palace. It looks out onto a hanging garden that stands over the ancient Baths of Constantine, some of the remains of which are still visible. 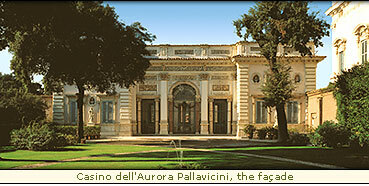 The whole complex was bought by the Rospigliosi-Pallavicini family in 1704. A valuable early baroque complex, it owes its architectural originality to the insertion all over the facade of marble reliefs taken from the slabs of Roman sarcophagi dating back to the 1st and 3rd centuries A.D. Famous for the celebrated "L'Aurora" fresco painted by Guido Reni between 1613 and 1614 on the ceiling of the central room of the pavilion. Other important works are the frescoes by Paolo Bril, Antonio Tempesta, Giovanni Baglione and Domenico Cresti.